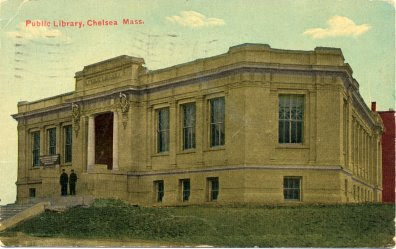 The Chelsea Public Library in Massachusetts was founded in 1870. A new building donated by Eustace C. Fitz opened in 1885. Disaster struck in 1908 when the Great Chelsea Fire destroyed the building. The Chelsea fire of 1908 destroyed 1,000 buildings in all and left more than 10,000 people homeless. The library's entire collection of 80,000 volumes was consumed by the fire. 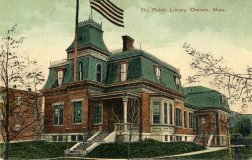 Andrew Carnegie gave $57,500 for a new library in 1908 which was added to $20,000 in insurance money. The Carnegie building was dedicated in 1910. I have three postcards that document these events. 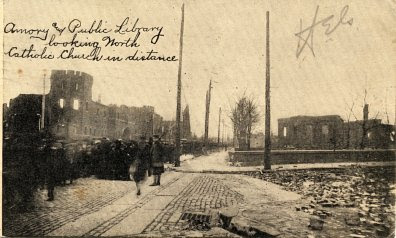 The first shows the Fitz library, the second shows the results of the fire, and the third shows the Carnegie building. The Chelsea Public Library still occupies the Carnegie building. More information can be found here. On exhibition in the Donohue Rare Book Room through October 9 is the recent acquisition Walls: A Journey Across Three Continents (Santa Cruz: Quail Press, 1990) by master printmaker, Tom Killion. Exhibited with the book is an archive, on loan from the artist, which includes original watercolors and woodcut blocks used to illustrate the book. A prolific printmaker known for his depictions of Northern California and the California Coast, Tom Killion is also a bookmaker and illustrator who works in the fine press tradition. Among his works housed in the Donohue Rare Book Room are The Coast of California: Point Reyes to Point Sur (1979); Fortress Marin (1977); and the William Everson titles Eastward the Armies (1980) and In Medias Res (1984). The Gleeson Library is pleased to exhibit Walls in conjunction with the exhibition Silent Poetry: Woodcut Prints of the California Landscape by Tom Killion in the Thacher Gallery. An opening reception will take place in the Thacher Gallery and Donohue Rare Book Room on Thursday, September 6th from 5:00 p.m. to 6:00 p.m. followed by an artist lecture “Topofilia: The California Landscape in Japanese-style Woodcut Prints” in McLaren 250. A printmaking demonstration with USF students will take place in the Donohue Rare Book Room on Tuesday, October 2nd from 10:00 a.m. to noon. Both programs are free to attend and open to the public. Slipper Party! Gleeson Library is Open All Night 5 days a week! The Gleeson Library | Geschke Center is having a Slipper Party! ScienceDirect and Scopus are expected to be offline and unavailable for approximately 19 hours on Saturday, August 25th, 2012 for scheduled maintenance for a new release. The estimated hours when they will be inaccessible is 4:30 AM until 11:30 PM Pacific Time. This scheduled outage is beyond the control of Gleeson Library — it was scheduled by Elsevier, the company that owns these databases. We apologize for any inconvenience. The USF Book Club will meet and discuss A.S. Byatt’s “Angels and Insects” on 9/7/12 at noon in Gleeson room 209. Join us.